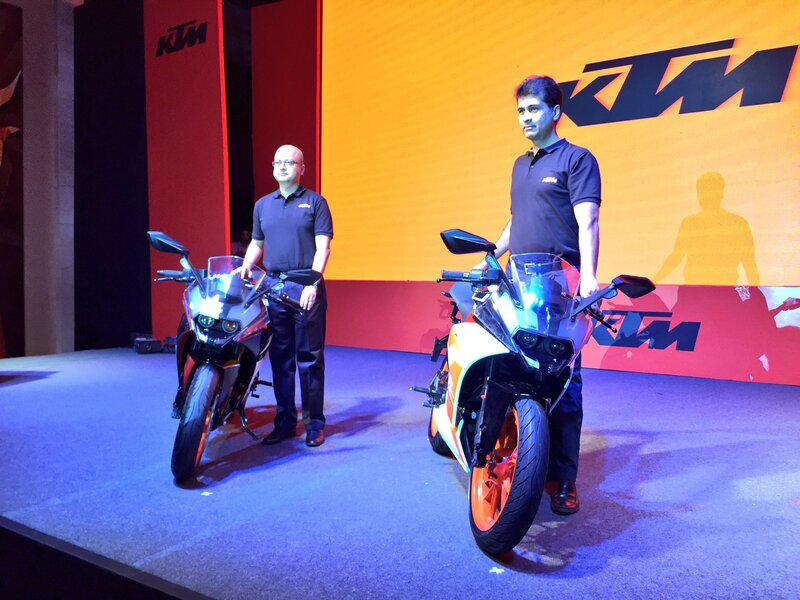 The KTM RC390 and KTM RC200 are manufactured in India and exported worldwide. 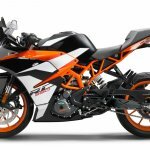 KTM has launched the 2017 KTM RC390 and 2017 KTM RC200 in India, and are compliant with the upcoming BSIV emission norms. 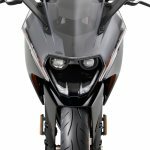 Deliveries of the RC390 will begin by mid-February 2017 while the RC200 will start by end-January 2017. Getting serious mechanical updates, the KTM RC390 seems even more alluring. The 373.3 cc single cylinder liquid-cooled mill gets a slipper clutch and ride by wire. Coupled to a 6-speed gearbox the engine is capable of producing 43.5 PS of maximum power at 9,000 rpm and 36 Nm of peak torque at 7,000 rpm (increased from 35 Nm). The fuel tank has been shrunk to hold 9.5 litres of petrol. 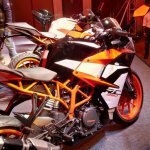 The bike tips the scale at 170 kg and a power to weight ratio of 256 PS/tonne. 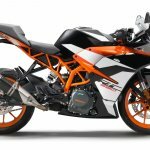 The 2017 KTM RC390 gains a bigger 320 mm front disc (up from 300 mm) and new exhaust system with a stainless steel underfloor pre-silencer and a rear aluminium absorption silencer containing the catalytic converter. 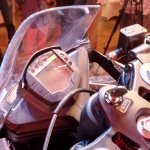 Front brake and clutch levers are now adjustable, and the Evaporative Emission Control System (EVAP) is also new. It also gets a new Controller Area Network (CAN Bus). The new paint is UV resistant, and the rear view mirror is slightly bigger. 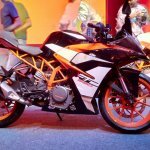 The 2017 KTM RC390 has been priced at INR 225,300 which is INR 11,024 more than the outgoing model. 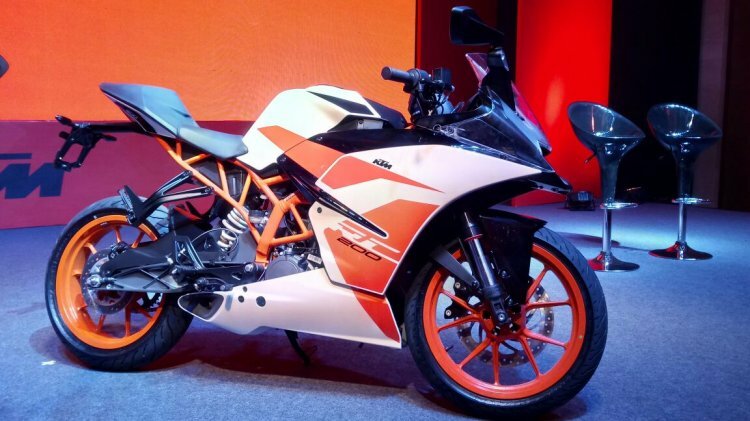 The 2017 KTM RC200 gets a new white and orange paint scheme which looks like a step down from the dark colour option the 2016 version had. The 199.5 cc single cylinder liquid-cooled mill is coupled to a 6-speed gearbox. The engine is capable of producing 25 PS of maximum power at 10,000 rpm and 19.2 Nm of peak torque at 8,000 rpm. Brakes are the same 300 mm single front disc and a 230 mm rear unit. ABS continues to be absent. 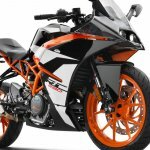 The 2017 KTM RC200 tips the scales at 154 kg. Apart from the new colour, the pillion seat gets 12 mm of extra padding. 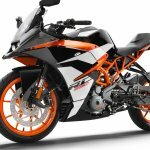 The KTM RC200 gets only cosmetic changes apart form BSIV compliance. 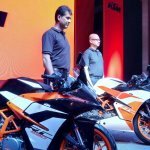 The 2017 KTM RC200 is priced at INR 171,740 which makes it INR 2,323 more expensive than the 2016 model.